Trying to double to 10.4 % meant focusing on areas where we were already strong. A number of other aims were also set – continuing to strengthen our profile with young people, women, people with foreign backgrounds and people in large cities. Another aim was to recruit new members and others who could actively contribute in different areas. In the end, some, but not all, of the goals were achieved. In the 2006 elections, we were successful with young people, students in major cities and people with foreign backgrounds. Small entrepreneurs and public transport users as well. However, we did lose some voters in sparsely populated areas. In the 2009 elections to the European Parliament, the Swedish Green Party was the first choice for voters under the age of 30. 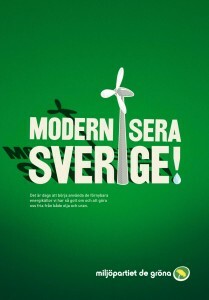 After the 2006 elections, the climate issue hit the top of the political agenda – according to the polls, voters believed the Swedish Greens was the best party to deal with it effectively. Citizens also now have more confidence in us on the economy and issues concerning small entrepreneurs. The confidence ratings for our spokespersons are also higher than before.